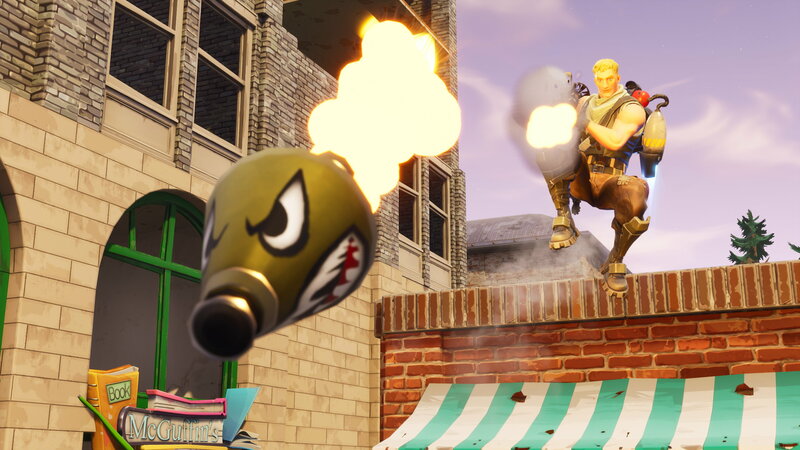 This week’s Fortnite Battle Royale is a real double blammy, re-adding the exiled guided missile launcher and launching a new event mode filled with explosives and jetpacks – always a sensible combination. 100 players leaping and rocketing around while launching rockets, piloting missiles, and phlunging grenades makes for some silly fun, from the rounds I’ve played. And I’m not just saying that because long-dormant Quake skills have re-emerged to rocketmurder many more people than I usually bag in a round. But that does help. Epic Games removed the guided missile launcher back in April cos it was simply too powerful, letting players hide away while safely demolishing structures and murdering players. Now it’s rebalanced and back, maybe for keepsies? The missile now moves slower, has a shorter fuse, reloads more slowly, deals about a quarter less damage to players and two-thirds less to structures… it’s nowhere near as strong. Epic talk about wanting it to be used for scouting more, rather than all murder all the time. If you want to try the new guided missile, you’ll find one sharpish in the new Fly Explosives ‘limited time mode’. It takes ye olde High Explosives mode, which replaces all weapon pick-ups with explosive weapons, and sprinkles jetpacks all over as loot. Epic have supercharged the jetpack for this too, making its fuel last longer and regen faster, so players are whooshing all over. The Fly Explosives LTM seems fun! Silly, but fun. I have enjoyed doing explosions on people. The opening seconds of battle royale rounds can be a little bland, decided by whoever gets the biggest gun, but when odds are good you’ll have a rocket launcher next to you when you land… pew pow. See the v5.10 patch notes for more on today’s update. Fortnite Battle Royale is free-to-play through Epic’s own client. Still trying to get to grips with Fortnite? Check out our Fortnite guide hub for more tips and tricks for the game. You can also find the latest challenges in our Fortnite week 8 challenges guide. Tagged with Epic Games, Fortnite Battle Royale. Have You Played... Batman: Arkham City?